At the start of Kingdom Hearts, things were relatively simple. There was just a boy and his two best friends: Riku and Kairi. Together they lived on an island, where they one day decided to build a raft to sail far away. But before that could happen, a terrible storm blew into their peaceful island living and the three were torn apart. Sora, the hero of this tale, awoke alone in Traverse Town. Young and naive, he quickly meets a ragtag group of familiar Final Fantasy characters, before literally bumping into Donald and Goofy (of Disney, obviously). Together, the three set out on an adventure to find their friends. Sora's in search of Kairi and Riku, while Donald and Goofy need to find King Mickey. (Yes, that Mickey.) They're successful—somewhat—though by the end Mickey and Riku find themselves separated from their friends yet again. And that's when it starts to get crazy. For the sake of brevity, there will be a lot I overlook in this condensed Kingdom Hearts primer. I figure for the casual sorts of players who haven't played every side game in the series or don't need to know every tiny bit of lore, this still-extensive retelling will suffice. So buckle up folks, because by the end of this we'll all be adopting Goofy's voice and saying, "Gawrsh, how could anyone be expected to comprehend all this?" 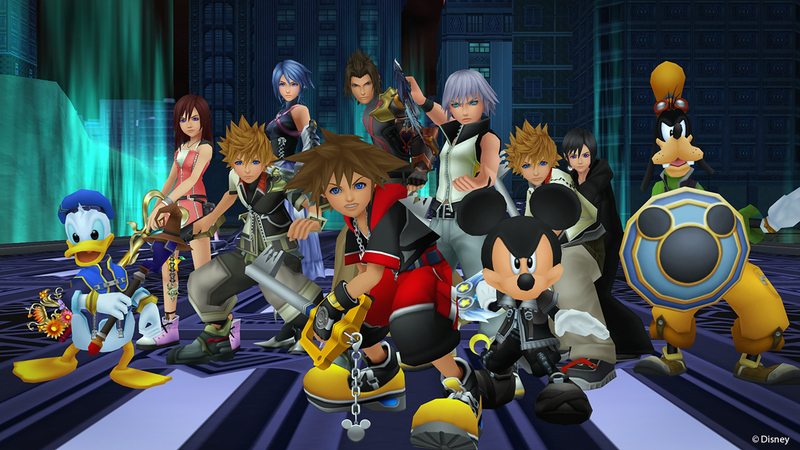 Since 2002, 10 games in the Kingdom Hearts canon have been released. A couple of them aren't as fully featured as Kingdom Hearts proper, but each one carries forth an essential narrative thread; another piece to an ever-expanding (and forever complicated) puzzle. Unlike most video games' spinoff titles, every Kingdom Hearts is canon, where everything is deemed essential. Without a puzzle piece, for instance, you might be left clueless on key characters such as Ventus. But I'm here to clear it all up for you. The overarching hero of Kingdom Hearts is a teenage boy named Sora. He's a nice kid with a good heart—literally, maybe the best heart—who does his darndest to help anyone who crosses his path, be they an obscure Disney character he meets in passing or his best friend since childhood. The series follows Sora and his many friends, as well as a bitter old man who vows to live forever and maybe even achieve godliness. The big bad is as evil as they come; ruining lives and orchestrating tragedies for well over a decade in the world of Kingdom Hearts. Below, you'll see maybe the best TL;DR description of Kingdom Hearts' journey; better than all these thousands of words you're about to read. But I digress: to break down the Kingdom Hearts story, particularly the thread better known as the Xehanort Saga, we need to do it from the very beginning—and I don't mean with the first Kingdom Hearts. I'm talking about the origins of everything, which happened across Kingdom Hearts χ (pronounced "key") and Birth By Sleep. Kingdom Hearts χ plops you over a hundred years prior to the events of Kingdom Hearts, during the time leading up to the horrific Keyblade War which left most Keyblade wielders dead. The fighting was onset by the Master of Masters and the Book of Prophecies, which foretold the destruction of pretty much everything. This fracture is shown with its five unions (you choose who to align with) who are battling for dominance after the Master of Master's disappearance. Rather than protecting the thing that needed guarding most, Kingdom Hearts (the source of all light, a.k.a. all that is good) and the χ-blade (an ancient keyblade tasked with protecting Kingdom Hearts), war ensues. The bickering led to the the ancient χ-blade shattering into seven fragments of light (later becoming the Seven Princesses of Heart) and 13 slivers of darkness. Kingdom Hearts itself vanished, and the worlds, in result, were left in ruin. Keyblade wielders were largely no more. And so comes power-hungry Xehanort. Birth By Sleep is perhaps the most important of the non-numbered Kingdom Hearts entries. In Birth By Sleep, you take control of three young keyblade apprentices under Master Eraqus. There's Aqua, the only one in her group to successfully pass her Mark of Mastery (which Xehanort secretly tampered with) to become a Keyblade Master. There's Terra, a brute-force kinda guy with a weakness for darkness; and finally Ventus, who's basically the Birth By Sleep circle's Sora. Birth By Sleep is set a full decade before Kingdom Hearts, though still long after the events of χ. Together, the three of them are on separate missions to find the missing Master Xehanort. Ventus, though, chases after Terra after learning that something bad might happen to him. Meanwhile King Mickey, another prominent character in the Kingdom Hearts series, is training as an apprentice under sorcerer Yen Sid (of Fantasia fame). Xehanort is semi-successful with his goals. He kills Master Eraqus. And after his possession of Terra awakens with amnesia after lots of battling, he meets Ansem the Wise—the man whose identity he eventually steals when Xehanort gains power over Terra's body again. He fails at the former, and Ventus is stowed away safe from harm in the hidden Castle Oblivion thanks to Aqua, trapped in a comatose state without his heart. Aqua, in the midst of trying to save Terra before his amnesia, dove into the Realm of Darkness to save him. It's still unknown if her efforts were ever truly successful. Since the end of Birth By Sleep, she's remained trapped in the dark abyss. Xehanort-Terra meanwhile is split between Ansem, Seeker of Darkness, and the leader of the Nobodies (shells of people left behind by strong-willed folks who lose their heart) cluster Organization XIII, Xemnas (who is Xehanort's own Nobody). In the events of A Fragmentary Passage, a section introduced in Kingdom Hearts 2.8: Final Chapter Prologue (yes, I know), a still-trapped Aqua comes back into contact with King Mickey, who tries to help her escape. When Riku is about to be attacked by an ambush of Heartless though, Aqua stays behind to hold it back. She embraces her sad fate as a guide to people who fall into the Realm of Darkness with no hope of getting out. As mentioned above, Sora, Donald, and Goofy successfully defeat Ansem. Though it comes at a cost, with Riku, Mickey, and unbeknownst to them, Aqua, still in the Realm of Darkness. You would think with all this drama behind Sora that he'd take some time to relax, maybe even visit his parents that we heard at the very start of the first game or something? But oh no; he's back to zipping around the universe. There are only two games set in between Kingdom Hearts and its sequel: Chain of Memories and 358/2 Days. The first stars Sora and his regular party as he explores Castle Oblivion, baited there by a hooded figure—a member of Organization XIII. In the castle, the trio lose their memories. Eventually, a girl named Naminé, manipulated by a member of the Organization (of which she is held captive), is revealed to be the one who's been causing Sora and his friends' memories to vanish. After the lord of Castle Oblivion is taken down, Naminé puts the three into pods where they can regain their memories. Riku, as well, plays a role, where he is brought out of the Realm of Darkness by the mysterious DiZ, an ally. Meanwhile 358/2 Days stars Sora's Nobody Roxas, who is born from the time Sora loses his heart in the first Kingdom Hearts. 358/2 Days follows Roxas during his time in Organization XIII, explaining away why he left the group, and partially how Sora's memories were restored again. This leads us to Kingdom Hearts 2. At the start, it pulls a Metal Gear Solid 2, having us play as Roxas for the first handful of hours in Twilight Town. Here, it's been a considerable amount of time since the events of 358/2 Days. He's living as a normal teenager with no memories of his past, and worries about summer school projects. He still enjoys his sea salt ice cream though, as he did in 358/2 Days with his friends. And there's a catch: he's living in a simulation of Twilight Town, put there by the DiZ who saved Riku. Slowly though, strange things happen around him. Mysterious people drop in to visit, including his old Organization buddy Axel, who's flabbergasted at the fact that Roxas bears no memory of him. After a series of run-ins with Organization members and the careful help of Naminé, eventually, Roxas is able to merge with Sora. Sora is finally complete again, though his memories of what happened during Chain of Memories and who he met there are all gone. At the end of Kingdom Hearts 2, everything is seemingly fine and dandy. Kairi, Donald, Goofy, and Mickey are back on Destiny Island when Sora and Riku crash land back. They swim ashore, Kairi waving at them in the distance, before Goofy and Donald tackle Sora, and Mickey hugs Riku—those two have shared a massive journey of their own in the background of everything, after all. Kairi and Sora meet face to face again, and the ghosts of their Nobodies (now living within them) Roxas and Naminé appear and smile at each other in a sweet moment. At this moment, with the finality of everything, it was easy to think that this was the end of Kingdom Hearts. It wasn't. Everything post-Kingdom Hearts 2 has been the most instrumental in setting up Kingdom Hearts 3. Birth By Sleep, the prequel released five years following Kingdom Hearts 2, introduced three new heroes that would become key to the plot. With Sora's propensity for his heart to connect to people and potentially save those who have been lost, the goal in Kingdom Hearts 3 is clear, even if it's not known to Sora yet: he has to save them all. In the secret ending for Kingdom Hearts 2, Sora reads a letter addressed from King Mickey, who has presumably gone off to do his own thing after the tender ending of the main game. The letter isn't revealed to the player (though it is shown in Coded), and while it's vague on details, it's enough to jumpstart Sora into packing his bag and going on another world-hopping trip with his trusty keyblade at his side. After all, when Sora hears the call to help people, it's his duty to answer. Despite destroying both of Xehanort's living halves, sorcerer Yen Sid (Mickey's aforementioned mentor) urges Sora and Riku to prepare for the worst. In Dream Drop Distance, he puts the two through their own Mark of Mastery exam, as the Birth By Sleep trio did at the start of their own game. The two heroes are sent back in time around the era of the first Kingdom Hearts, with the task of unlocking seven sleeping worlds' keyholes to return them to the Realm of Light. Things go awry when they frequently encounter familiar old foes: Ansem, Xemnas, and a new gray-haired fellow: teen-Xehanort. The end of the test gets even worse when Sora's lured into a trap and put into a deep sleep, with the goal of Xehanort's to turn Sora into another vessel for him. Riku has to save the day, and learns that young Xehanort has been told by old present-day Xehanort to grab all the Xehanorts across time to compile a true Organization XIII. Think like Voldemort's Horcruxes, but just all the same dude with his Nobodies and other vessels. With the legit Organization now formed, Master Xehanort is able to resume his old form. This all barrels into what to expect in Kingdom Hearts 3. In a secret cutscene at the end of Dream Drop Distance, Yen Sid talks about Xehanort's plans at length, including his plan to try to forge the χ-blade again as he once attempted in Birth By Sleep with Vanitas and Ventus. His plans are stronger now though, as his targets are set on familiar victims: seven pure hearts, who were also a target in the first Kingdom Hearts. Kairi, one of these Princesses of Heart, is then summoned to start training to be a keyblade wielder like Sora and Riku. She's sent off to train under the wizard Merlin alongside Axel, now known as Lea. At the end of A Fragmentary Passage, Riku and Mickey have gone off to rescue Aqua from the Realm of Darkness. (And as we saw in a trailer recently, might have a dark version of herself now too.) Meanwhile Sora, having almost been stripped away by Xehanort in the events of Dream Drop Distance, finds himself weaker than he's been in awhile. Then he's reminded of Hercules, who lost his powers and later regained them. Together with Donald and Goofy, the last we've seen of Sora is him in his Gummi Ship, looking onwards to another adventure. So that's where we're at. Xehanort, in his lifelong quest for immortality and ruling the world with darkness, has meddled in multiple generations of young keyblade wielders' lives: from Nobodies like Roxas to budding keyblade masters like Ventus and Terra. It's all building up to the most pure-hearted of them all: Sora, and his strong heart that seems to save everyone and give a little ounce of hope. Heading into Kingdom Hearts 3, we have a loose idea of what everyone's up to. Sora's heading to the Olympus Coliseum to hopefully get strong again. Riku and Mickey are on a rescue mission. Kairi's learning how to be a badass on her own, with a new friendship (or more?) with Axel blooming. Xehanort, the puppet master who's been pulling the strings behind the scenes for well over a decade over these kids' lives, might finally be due for the comeuppance he deserves. Unfortunately, he's also closer than he's ever been to rebuilding the χ-blade, unlocking Kingdom Hearts, and making himself basically a god. Scary stuff! But no matter, Sora, Kairi, Riku, and everyone else is on the case to stop him. We'll all see the end soon, when Kingdom Hearts 3 releases on PlayStation 4 and Xbox One on January 29. Tagged with Action,	Android Devices,	Game Boy Advance,	iPhones,	Microsoft,	PlayStation 2,	PlayStation 3,	PlayStation 4,	PlayStation Portable,	Retrospective,	Role Playing Games,	Sony,	Square Enix,	Xbox One.